However, the wing is the province’s only new injury concern as they work through a five-day turnaround to face Munster. WING CIAN KELLEHER is Connacht’s sole new injury concern after they fell just short of a famous win away to Leinster on Monday. The speedster suffered a head injury midway through the first half of the 21 – 18 loss in the RDS and was replaced by Niyi Adeolokun having been unable to re-take the field after his HIA. The 23-year-old is the only man to be ruled out of Saturday’s third winter inter-pro against Munster in Limerick (kick-off 19.45). However, with just a five-day turnaround between away derbies, Kieran Keane may well still need to change up his starting XV after two impressive performances in the holiday period. Former Ulster wing Rory Scholes will hope to earn some match minutes in the European ties ahead if not this weekend. The 24-year-old was back in full team training this week after appendix surgery. Lock Andrew Browne is also pencilled in for a return ‘early’ this month after his Achilles injury, but Denis Buckely will remain sidelined until the middle of next month after undergoing surgery on an ankle injury sustained in the win over Brive last month. Email “Connacht rule Kelleher out of Munster clash with head injury”. 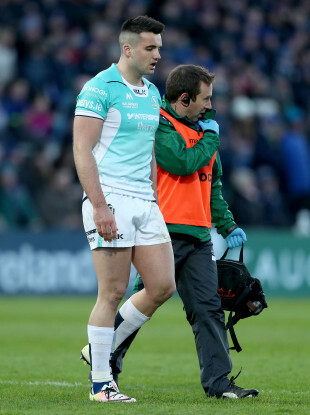 Feedback on “Connacht rule Kelleher out of Munster clash with head injury”.